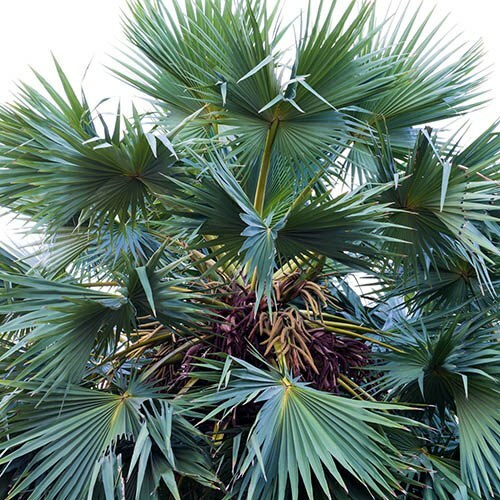 This new hardy palm adds a new colour dimension to exotic and tropcial gardening, with it's steel blue grey fan palm foliage. Reportedly even hardier than the plain green species, they originate form the Atlas Mountains of Morocco where they're exposed to the cold there and will therefore survive -10C in the UK once established. Very slow growing it makes an excellent specimen in a large pot for patios and decking, requiring little maintenance in the year. Supplied as 5 year old plant in 3L pot approx. 40-60cm tall, ready to plant out and will grow to approx. 1.5m tall. This little gem of a hardy palm adds a new colour dimension to exotic and tropcial gardening, with it's steel blue grey fan palm foliage. The colour can be variable, but is stronger in full sun. Reportedly even hardier than the plain green species, they originate form the Atlas Mountains of Morocco, so get extreme cold there and will survive -10C in the UK once established. Very slow growing, so makes an excellent specimen in a large pto for patios and decking, requiring little maintenance in the year. Stock is limitted at this price, and is rarely sold in this size, so please order early. Supplied as 5 year oldplant in 3L pot 40-6-0cm tall.